To do the Basic Forearm Front Plank, lie on your stomach and bend your elbows so that you’re propped up on your forearms. Your legs should be straight out behind you with your feet together. Flex your feet and lift up onto your forearms and toes. Your elbows should be stacked under your shoulders and your feet should be together. On your forearms and toes, create a nice straight line with your body from your head to your heels. Make sure that in this position you are concentrating on tucking your pelvic to engage your abs as you squeeze your glutes and quads to keep your legs straight. Make sure that you are also squeezing your legs together as you hold and driving back through your heels. Do not push forward onto your toes. Also, do not let your chest sag toward the ground or your upper back round. You want a nice flat upper back. Feel your lats engage to pull your elbows down under your shoulders and toward your hips to protect your shoulders. Hold in this position for a set amount of time or until your form starts to break down. If you feel this in your low back, assess whether or not you are performing a proper Pelvic Tilt. 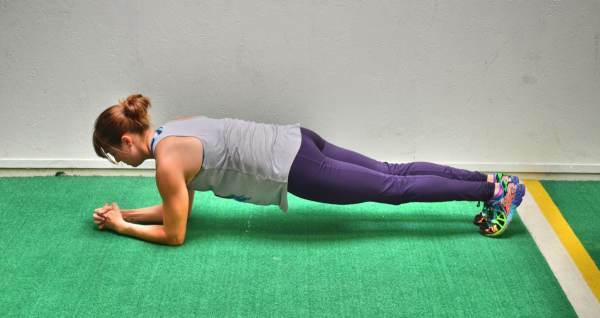 Beginners will want to start with a Plank from their knees. 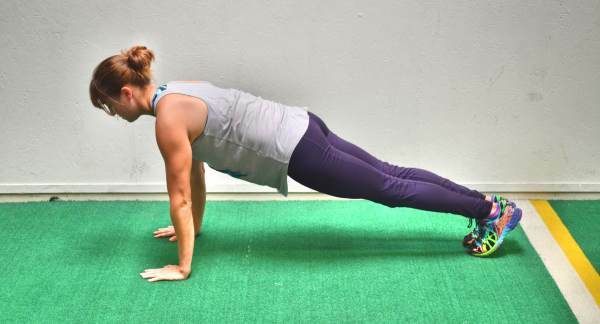 You can also do the Front Plank from your hands.